Russia has had a long historical tradition of a strong military and a special pride in its naval forces. From Peter the Great to the turn of the 20th century, the Russian Navy grew stronger and participated in many strategic battles. Following serious neglect during the immediate post-1917 Revolution years, the Navy again rose to glory on the back of massive Soviet investment in its shipbuilding industry. After the collapse of the Soviet Union and the end of the Cold War, the Navy has again suffered neglect as Russia was not able to maintain the massive fleet. Today, the Russian Navy is facing a serious crisis in terms of both equipment and personnel and is badly in need of reform. 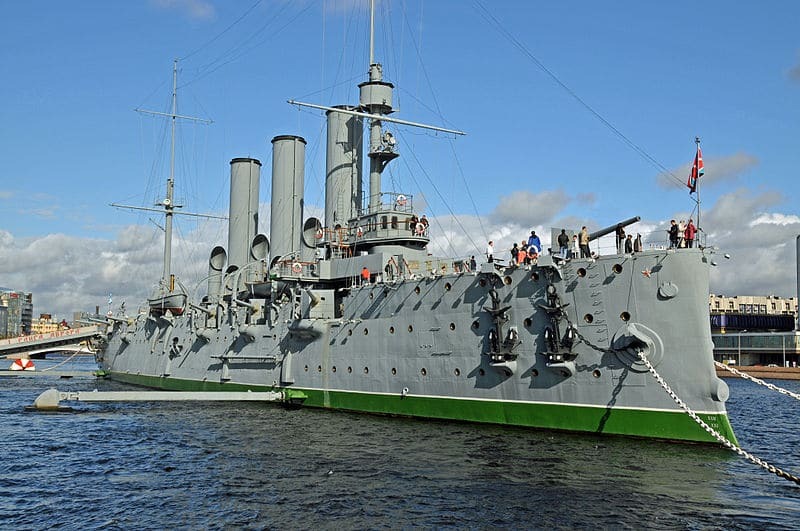 The Aurora battleship, which once served as part of the Baltic fleet. It is now a museum in St. Petersburg. Photo by Erin Decker. – 1 Project-677 diesel submarine. Peter I (the Great) is generally credited with the official creation of the Russian Navy in 1696, after Russia’s second campaign to capture the Turkish fortress of Azov during the Russo-Turkish War of 1686-1700. Previous campaigns had failed because of the difficulties of moving large armies across the steppe, so Peter I decided to try a simultaneous land and water approach. He employed two warships, four “fire ships” (wooden sailing ships filled with combustibles that were set on fire and steered into enemy fleets), and twenty-three galley ships to move troops and supplies. Peter the Great’s fleet reached the Azov Sea via the Voronezh and Don rivers, where they successfully defeated the Turks and took the Azov fortress. After this success, Peter I requested funds from the Russian Boyar Duma, the tsar’s advisory council and state treasury, for the construction of a navy. A decree approving this was passed on October 20, 1696. By 1745, the Russian Navy consisted of 396 oared vessels and 130 sailing vessels. The Imperial Navy would come to consist of three main fleets. The oldest, the Baltic Fleet, was organized at Peter the Great’s command in St. Petersburg in 1703 during the Great Northern War, with its main base at Kronshtadt (now incorporated as part of St. Petersburg). Some ships from the “Azov fleet,” as the original ships built by Russia were called, were incorporated into this first fleet. Kronshtadt suffered substantial damage during World War II and the Baltic Fleet’s main base was subsequently moved to Baltiysk, in the Kaliningrad Region, in 1952, although there is still an operating naval base in Kronshtadt. The Black Sea Fleet began after Catherine II (the Great) annexed the Crimea from the Ottoman Empire in 1783 and established a naval base at Sevastopol on the Black Sea. Russia temporarily lost this strategically important port during the Crimean War that flared up in 1853 and during which the European Allies of England, France, and Turkey laid siege to Sevastopol for 349 days. The 1856 Treaty of Paris subsequently turned the area into neutral territory, depriving Russia of its base. However, beginning in 1870, Russia stopped following the treaty and began to gradually rebuild its naval presence there. Sevastopol remains the main base of Russia’s Black Sea Fleet today, leased by Russia from Ukraine for $98 million per year. With the contract set to expire in 2017, and Ukraine’s leadership demanding that the sum be raised to $2.5 billion or more per year, Russia began construction to expand an auxiliary base at Novorossiysk, which is also on the Black Sea but in Russian territory and which Russia also wants to develop further as a major commercial port. However, with the election of the Russia-friendly Viktor Yanukovich, the fate of the fleet in Sevastopol is more secure, although it remains a hot political issue in Ukraine. Only 17% of Ukrainians support the continuation of the base and the Ukrainian Constitution actually forbids foreign military bases on its soil, although an exception was made for Sevastopol for an undetermined “transition period.” However, with a large package of deals on the table for renewed Ukrainian-Russian relations, it is likely that the base may be kept as part of a larger deal to secure Russian investment and improve energy relations. Construction of the new base in Novorossiysk has been plagued by delays and, given the current economic crisis, it is possible that the completion of the naval base will be delayed, perhaps even indefinitely. The Pacific Fleet was founded after the establishment of the far-eastern city of Vladivostok in 1859. Russia also maintained a naval base at Port Arthur, now in Manchuria, China, which became the scene for the opening battle of the Russo-Japanese War of 1904-1905. Although considered to be one of the strongest in the world, Russia’s Navy was devastated by the Imperial Japanese Navy and Japan took control of Port Arthur in the war. The Pacific Fleet sustained major damages and losses, as did the Baltic Fleet, which sent many of its vessels to the Far East for reinforcement. While the Russian navy would make some recovery after the war, it was smaller and less prepared for war than its opponents in WWI. The strain of that conflict would help push Russia to revolution in 1917. – 1 Project-641B diesel submarine. The October Revolution was unofficially begun when the Russian Imperial Navy cruiser Avrora, with her predominantly Bolshevik crew, refused orders to take to sea and fired a shot from her forecastle gun, initiating the storming of the Winter Palace in St. Petersburg. A 1918 government decree officially established the Soviet Navy as The Workers’ and Peasants’ Red Navy (Рабоче-Крестьянский Красный Флот), however, restoration of the Navy during the beginning of the Soviet era was slow. A large-scale naval shipbuilding program was only implemented in 1926 as part of the Soviet Union’s general industrialization plans. The first order included plans to construct 12 submarines, which would remain popular with Soviet military planners throughout the history of the USSR. The Northern Fleet, which is now modern Russia’s fourth major fleet – and also its largest and most powerful, was founded in 1937 on the basis of the Northern Naval Flotilla and Russia’s rising tide of ship construction. The Northern Fleet rose to preeminence in the Soviet era under the command of Admiral Sergei Gorshkov and its main base in Severomorsk along the Arctic Ocean would come to hold the largest concentration of nuclear-powered surface and submarine forces at the height of the Cold War. Despite the establishment of this soon-to-be powerful fleet, the Soviet Union entered World War II with mostly pre-WWI era ships and did not play a major role in the war’s naval theatre. Many ships and submarines of the Baltic Fleet near Kronshtadt were blockaded by minefields and sunk, although Soviet submarines played an important role in disrupting enemy navigation in the Baltic Sea. Also, destroyers from the Northern Fleet helped defend Allied convoys transporting lend-lease cargo from America to the USSR across the Arctic Ocean. After WWII, the Soviet Navy’s name changed to The Naval Fleet of the USSR (Военно-Морской Флот СССР). The Navy quickly embarked upon a program to boost its military power and catch up with the West, another mantra that would stay with Soviet planners during their reign. The Soviet Navy’s main objectives during the Cold War era were interceptions of NATO convoys and targeting the US’s aircraft-carrier battle groups, which it viewed as a particular national security threat as the range of such weaponry could allow the Americans to launch an attack quickly, deep into Russian territory. Considerable resources were invested into anti-ship cruise missiles which could be launched from submarines, surface ships, and shore-based aircraft. The Soviet Union’s WWII-era Navy underwent a rapid modernization in the 1960s and 1970s, becoming a sleek new force of submarines and guided-missile cruisers and destroyers. The Soviets also made several remarkable technological advances in submarine technology. Russian subs were perhaps most feared by American naval war planners because of the difficulty in tracking them and because they could deliver payloads of nuclear missiles close to America’s shores. The Akula-class (Акула, meaning “shark”) nuclear-powered ballistic missile submarine is the largest class of submarines ever built, with a displacement of between 33,800-48,000 tons when submerged. The submarines’ massive size came from the fact that they were designed with multiple pressure hulls to make them more resistant to flooding if one hull was breached. They are also among the quietest Soviet-built sea vessels and can stay submerged for periods of up to 180 days. By comparison, the second largest class of submarines, the US’s Ohio-class, weighs in at 18,750 tons when submerged. The crew sizes and overall weapons capabilities of these two submarine classes are comparable. The Akula‘s size is largely used in reinforcement and making it more durable to attack. Also interestingly, the US also had Shark-class vessels and so the Russian type is only referred to by the transliterated “Akula” or the NATO reporting name of “Typhoon,” invented so as to avoid confusion when speaking to international audiences. 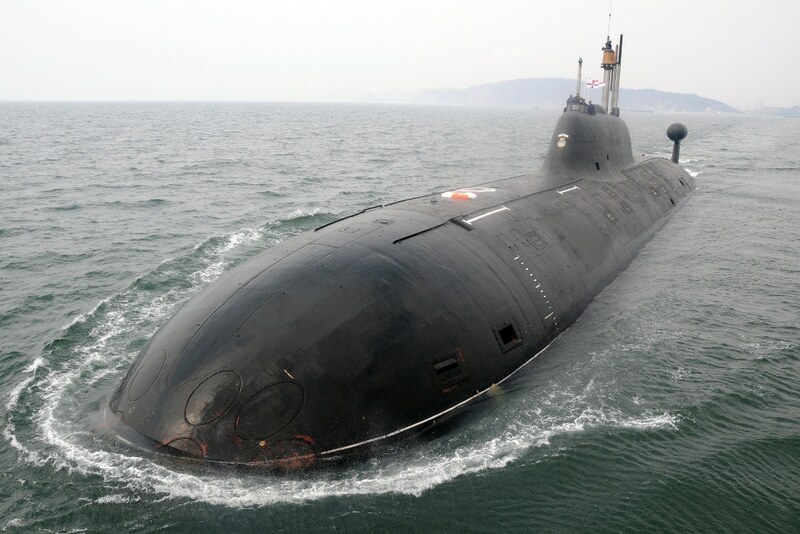 In all, six Akula-class submarines were built by the Soviet Union; the first to be built and launched, the Dmitry Donskoy, remains in active service with the Russian Navy to this day. The Nerpa, an Akula-II type nuclear-powered submarine, made headlines in 2008 when its crew accidentally activated a fire extinguishing system during a training exercise. Twenty people suffocated as a result. The submarine still serves in the Pacific Fleet. 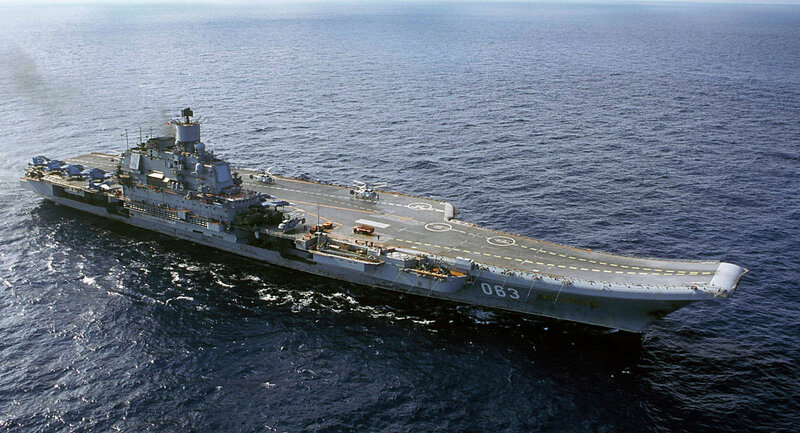 Although the Soviet Navy believed that aircraft carriers were a threat, it chose to place less emphasis on aircraft carriers and naval aviation than their Western counterparts. This was in large part due to the Soviet Union’s limited resources and the high cost of the enormous carriers. Soviet war planners, especially under Nikita Khrushchev, who supported the reasoning, also chose to focus spending on nuclear capabilities, which they saw as far more effective weaponry. Although the Soviet Navy maintained a strong Naval Air Force, land-based aviation was traditionally emphasized over sea-based aviation. After Leonid Brezhnev came to power, the Soviet Union began to consider aircraft carriers once more. It would launch a total of two Moskva-class helicopter carriers, one in 1965 and another in 1968. The first Soviet aircraft carriers to support fighter jets, the Kiev-class carriers, first appeared in 1975. By contrast, the US has been launching planes from ships since 1910 and the Japanese had used the technology in WWI. The number of planes that the Kiev could support was also relatively small if to compare to US carriers used at that time. The Soviets attempted to create an aircraft carrier comparable to American standards with “Project Orel” (from the Russian “орел,” meaning “eagle”) in the 1970s, but, as the Soviet military’s strategic priorities were constantly changing and as aircraft carriers remained a politically sensitive topic, the project was cancelled. The Soviets did manage to launch the first of the Kuznetsov-class carriers, the Tbilisi, in 1985. Built in the Ukrainian SSR, the project sought to produce a carrier that could compete with the Americans, but it was still plagued with problems and the Tbilisi only became fully operational in 1995. By that time its name had also been changed to “Admiral Kuznetsov” after anti-Soviet demonstrations were held in its namesake city as the Soviet Union began to crumble. Its sister ship, the Riga, was never actually commissioned (it too was renamed – to “Varyag” – after Riga also saw anti-Soviet demonstrations), and was sold to China by cash-strapped Ukraine shortly after the fall of the USSR. The Admiral Kuznetsov is the only carrier still in service in the Russian Navy. By the time the Soviet Union fell, the Soviet Navy was also being supported by a variety of auxiliary ships in addition to the naval fleets. It had 63 intelligence-gathering vessels in operation being manned by naval reservists and 11 specially-equipped vessels which monitored Soviet as well as foreign space launches. There were also, of course, several other types of armed ships. For example, the nuclear-powered Kirov-class battle cruisers, launched in 1980, were formidable war ships, carrying an array of guided-missile weaponry. Soviet battleships were also known for their missile capabilities and were built in plentiful numbers. They were also known for unique design characteristics, including hull design and one class with engines that could be easily removed for servicing. Elements of these ships were copied by other countries including India, China, and Peru. Interestingly, the Soviet Union also had the world’s largest fleet of oceanographic survey and marine research vessels in operation at this time which were tasked with gathering data on the world’s oceans that the Soviet Union considered crucial in wartime. It should be noted that both the US and the USSR were known for using scientific vessels for military intelligence gathering. After the collapse of the Soviet Union, funding for the Navy and defense expenditures as a whole dramatically declined and Russia became unable to deploy more than a few ships at a time and for substantially shorter periods of time. The Admiral Kuznetsov, Russia’s flagship and only operating aircraft carrier serves in the Northern Fleet. The state of the Russian Navy has greatly deteriorated since the fall of the Soviet Union and is now widely regarded as a small, weak fleet of decaying ships. Dozens of ships have been scrapped since 1990 and little new construction has taken place. Between 1990 and 1995, the number of Russian naval personnel declined by 50%. The Russian military as a whole continues to suffer from a lack of funding. To make matters worse, Russia’s military-industrial complex is also still largely working with soviet-era technology. Once centrally-guided by strict orders from Moscow, the complex is now a bewildering array of state enterprises and privately-held contractors and subcontractors that has proven highly inefficient at completing tasks on time and on budget. There is increasingly talk of purchasing new technologies or equipment from abroad. Russia’s once-robust shipbuilding industry is also plagued by problems. The costs of its projects are very high ($30-50 million), in part due to Russia’s high taxes and duties, which can increase the cost of a building a vessel by 20-25%. The projects also take a very long time to complete, often 2 to 2.5 times longer than the average in other countries because mechanization is low and 3 to 5 times the amount of labor is needed in comparison to most other industrialized nations. Since so many of the Navy’s vessels have 10 years of service life or less remaining, if the Russian Navy does not procure more new equipment, the entire Navy will consist of less than 50 vessels by 2019. Russia is currently considering purchasing a Mistral-class helicopter carrier from France and if it does, it will be the first time in Russia’s modern history that it has purchased major military hardware and technology from abroad. The Navy is also struggling with the issue of how to properly scuttle or dispose of their outdated vessels and equipment. 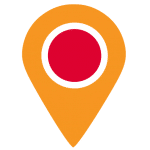 Murmansk, the headquarters of the Northern Fleet and at one time home to the Soviet Union’s highest concentration of nuclear-powered naval vessels during the height of the Cold War, is now a radioactive scrap yard. The harbors in and around the Andreeva Bay area on the Barents Sea contain an estimated 100 submarines which, in turn, contain spent nuclear materials. An additional 32 tons of radioactive material are stored on shore. In total, there is over 100 tons of nuclear waste in Murmansk, making it the largest concentration of such material anywhere in the world. Neither the submarines nor the onshore facilities are regarded as stable storage units. In addition to being an environmental risk, it is also becoming a local social issue. Residents of nearby Murmansk are concerned about the nuclear waste as well as about a potential relocation of the material to a more secure storage facility which would require the material to be transported directly through the city. Other countries, namely Britain and Norway, are attempting to assist Russia on disposing of the nuclear fuel, and the US has pledged funds to help dismantle 35 of the nuclear submarines. However, so far the assistance has been only financial, since the Andreeva Bay area remains a closed military base and off-limits to foreigners. The total bill to clean up the bay is likely to amount to some $3.5 billion, much of which Russia will need to pay itself. The current administration is also attempting to cut costs by reducing the Navy’s bloated officer corps as part of military-wide reforms. Some of the proposed reforms are to restructure its chain of command, reduce the surplus of senior officers, and move to contracted, professional service with higher pay for officers and servicemen. These reforms have run into strong resistance from top military commanders and have so far largely been seen as unsuccessful. Imperial Russia and the Soviet Union were major maritime powers. 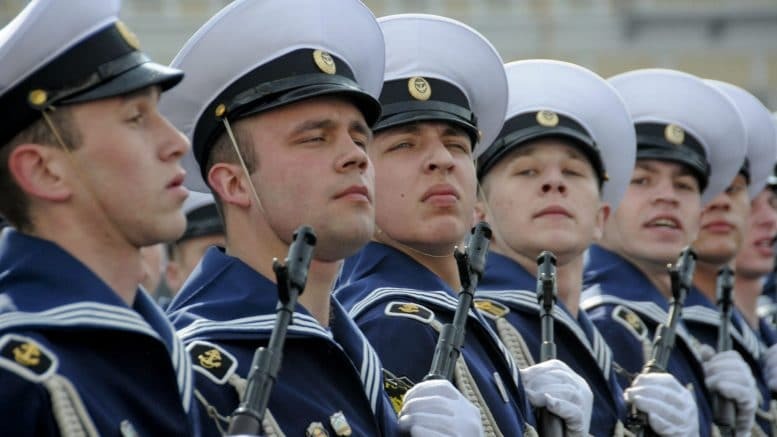 Following the collapse of the Soviet Union, the Russian Navy, like the rest of the country, has experienced the effects of political instability and economic crises. The Navy has, in many ways, become a liability for society, rather than an asset. The massive buildup of ships created by the USSR has proven a great burden for Russia – not only to maintain, but also to dispose of the aging equipment. The related nuclear fuel and weaponry pose environmental and social risks. The Navy’s internal structure, still based on the Soviet model, is ineffective and a strain not only on taxpayer dollars, but also on society itself, as the Navy still relies on often unwilling conscripts to staff its ranks. 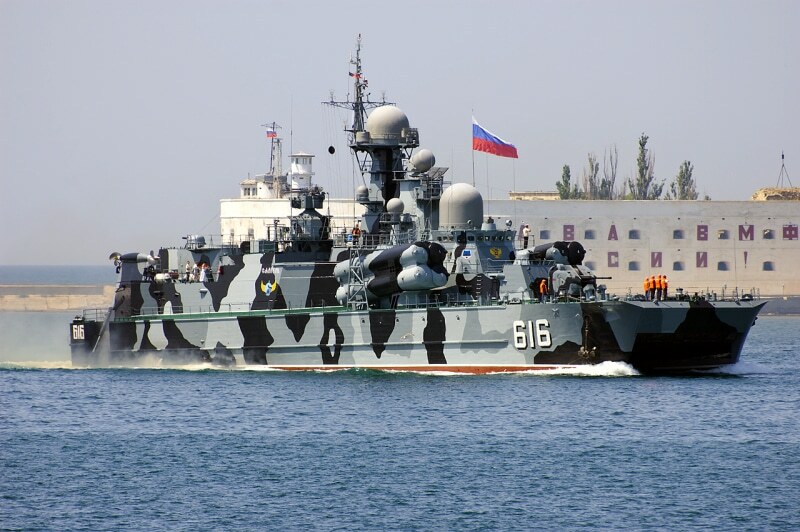 While just how strong is debatable, Russia does still need a Navy. Beyond remaining a global military power, Russia does have practical, immediate concerns that require a maritime force. Russia has extensive coastlines as well as assets such as off-shore drilling sites to protect. Russia’s export economy requires that ports and transport routes be protected and gives Russia a substantial interest in helping international efforts to combat piracy. In the post-Cold War era, the military must transition from a large force equipped to deal with large-scale campaigns to a smaller force that can more quickly mobilize against multiple conflicts, oftentimes with non-state enemies such as terrorists and insurgents. This may mean the need to prioritize smaller ships and a less-global force over continuing the soviet traditions of building monstrous nuclear submarines and debating aircraft carriers – at least for the time being. In any case, much reform and investment is needed if the fleet is to survive in a form able to protect Russia and Russian commerce. The Russian Navy is an essential component of the country’s military and must not be allowed to go under. This article was contributed by Erin Decker. She holds a B.A. in Political Science and International Studies from the University of Wisconsin-Madison. In 2009, she worked as an intern on SRAS’s Translate Abroad program, doing translations and writing articles. She is now working for SRAS helping to coordinate student programs and also contributes news, translations, and feature stories to the SRAS website.